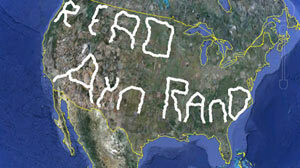 'Read Ayn Rand': World's Biggest Message? According to the website World's Biggest Message, which documents Newcomen's high-tech journey, he used a Qstarz BT-Q1000X GPS tracking device as a "pen" to write his message as he drove. When he wanted to create the lines that would form letters, he turned the device on. In between letters, he turned it off. The GPS logger lets users turn their travel records into files that can be displayed on a Google Earth map. Newcomen first mapped the route he would need to drive to spell out his message. Then he hopped into his car and spent part of the spring and summer of this year driving around. And he footed the entire bill. "The main reason I did it is because I am an Ayn Rand fan," he told Wired magazine. "In my opinion if more people would read her books and take her ideas seriously, the country and world would be a better place — freer, more prosperous and we would have a more optimistic view of the future." Others have used GPS technology to create art and communicate messages, but Newcomen may be among the most ambitious. He started his adventure in Marshall, Texas, outside a movie theater, then headed north. He passed through 30 states on his month-long trip, Wired reported. He ended up near Albany, Texas, about 300 miles from his starting point. "The first word I wrote actually was the word 'Rand', then I went up North to do the word 'Read' and finished it with 'Ayn,'" Newcomen said. Ayn Rand was an author and philosopher best known for her novels "Atlas Shrugged" and "The Fountainhead." She developed a philosophy she called objectivism. Many libertarians cite her as inspiration. Along with a description of Newcomen's trip, the World's Biggest Writing website includes a list of the top 10 reasons to read Ayn Rand. According to the list, "Atlas Shrugged" is the "second most influential book for Americans today" after the Bible, said a joint survey conducted by the Library of Congress and the Book of the Month Club.